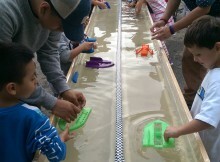 Moat Boat Paddle Battle at Ocean State Maker Mill! The Moat Boats are Back! Copyright © 2019 Moat Boat Paddle Battle.